It was a combination of poor luck and poor finishing that means this tie is going to a replay. Killie almost went ahead through a Josh Magennis header, but it went wide of Wes Foderingham‘s post. But Rangers grew into the game and became the dominant side. Lee Wallace forced a save from Jamie MacDonald and James Tavernier smacked the post. In the second half, it was much the same. Rangers poured forward and were denied by MacDonald from Halliday’s effort, Forrester shot inches wide, Danny Wilson‘s header smacked the crossbar and Waghorn’s touch deserted him before his late effort was blocked by Magennis. Kallum Higginbotham saw red late on for a terrible studs-up challenge on Tavernier. Yet another match that the big defender dominated. He was outstanding and won almost everything in the air, strong in the tackle and kept Josh Magennis quiet – apart from the header in the opening minutes. It’s getting to the stage that I may have to re-name the section the Rob Kiernan man of the match award. Mark Warburton, Dom Ball and Barrie McKay spoke to Rangers TV post-match. “It was frustrating not to get the rewards our possession deserved. We were dominant, controlled the football, created chance after chance, although we were a little bit lacking in the final third.“I thought we showed how good we can be today, and against a very good team, we dominated. “Their keeper made a couple of good saves, we made a couple of errors in the final third and there were some big chances we didn’t convert. One positive from the afternoon was the performance of the defence as they claimed their fourth clean-sheet in succession, and Warburton was full of praise for them, while also revealing he expects no issue with Rob Kiernan after he limped off in the second half. Warburton continued:“Lee has come here with a good Kilmarnock team, but I thought our two centre-halves were strong and dominant, Dom Ball [in holding midfield] was excellent, and the full-backs maintained a good shape. McKay got sponsor’s man of the match but he was left frustrated by the draw: “It was a hard one to take; we thought we had done enough to see us over the line but unfortunately we couldn’t take all of our chances. In the changing room afterwards, the lads were saying that it was good to get another clean sheet, but it just wasn’t our day attacking-wise today. We had loads of chances and just not finished them, and it’s the first game we haven’t scored in all season so it was a bit disappointing. It was the first time this season in all competitions that Rangers failed to find the net. Jamie MacDonald’s save from Andy Halliday in the second half. There was no repeat of St Johnstone. Rangers defended very well, and the triangle of Wilson, Kiernan and Ball dealt with anything Kilmarnock threw at them – and to be honest, after the early header Magennis was virtually anonymous in an attacking sense. Rangers imposed themselves on Killie, but yet again, the only small criticism you could make was the quality of the finishing. There wasn’t one player who didn’t get pass marks on the day. It was all down to missing that clinical edge in front of goal. 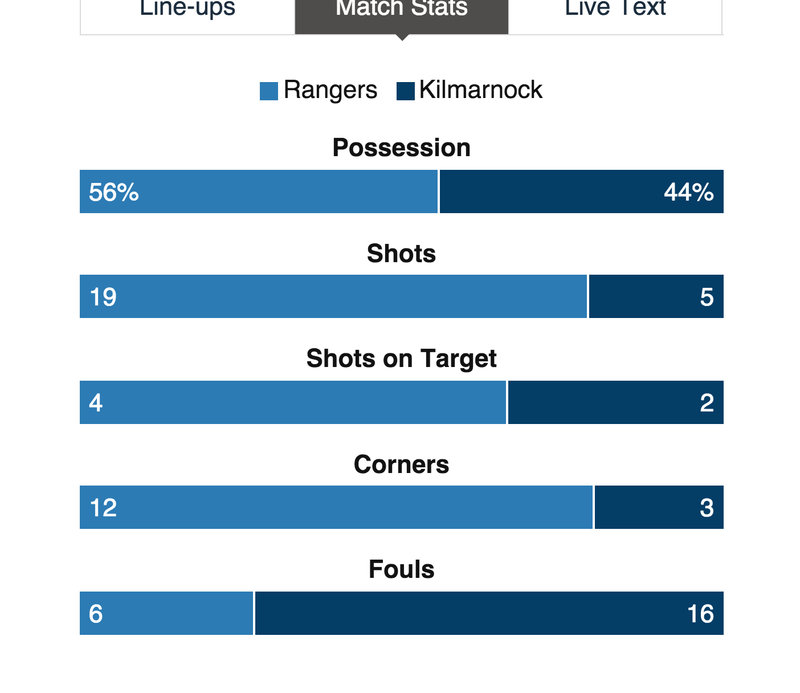 Killie came to play in the early stages, but after the opening 10 minutes had elapsed, they sat in playing for a draw. That played into Rangers’ hands as they came forward with wave and wave of attack. Maybe it could have been the game to tell Ball to make it a back three and push both full-backs on. Killie didn’t have anything like the threat of St Johnstone. The midfield wasn’t bullied. In fact, they looked the stronger of the two. Zelalem, Ball and Halliday stood up and more than matched Killie’s physicality. 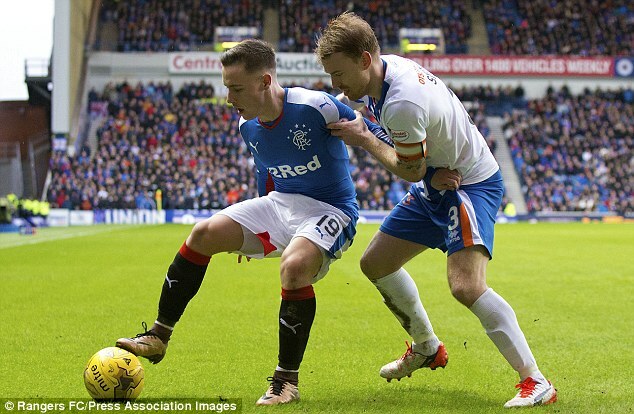 Waghorn’s touch deserted him on the day, but he roasted Stevie Smith more than once down the Rangers right-hand side. I am sure he will find his goalscoring touch in no time, although he does look quite tired at this point. If that is the best Killie have to offer, I’d fancy Rangers to go through to the next round. Bit of a shame we couldn't turn our dominance into a win but we just lacked that wee bit sharpness/luck at times. Great crowd! Did everything but score today. Thought Kiernan, Ball & McKay looked good & Zelalem was more like himself looking to push further forward. Rob Kiernan was superb again today, Proper love the guy. Decent on the ground, and excellent in the air too. Defence looks more settled,Kiernan is solid and Wilson seems to have screwed the nut and Ball continues to impress. Back to league duty on Saturday as Rangers visit Alloa. ← Which Rangers players have been the best at driving possession into the final third?